Gascoyne region, about 500km north of Perth. 70km North of Carnarvon. Take road to blowholes then 2WD gravel road north to Cape Couvier and the Korean Star Shipwreck. Big coastal site overlooking the wreck of the Korean Star. No beach, but top and bottom landings are possible. Kimberley, 450km SW of Darwin. Drive to Wyndham (3200km from Perth), 2nd right past the big croc signposted as "The Five Rivers Lookout" to the car park at the top. One of the worlds most spectacular landscapes, well endowed with hills and sunshine, and spectacular scenery. A bit of a wilderness too, so be prepared. Most of this info is from John Peircey who lives up there, give him a call if you are up that way. (SW-NW) 1100ft. Launch at the west site a little tight for PGs - a cement ramp for the stiffies tends to catch the outer set of lines but fine if helper handy. Great thermal site from a house thermal out over the small houses/cemetery to the left of launch. Good height gains from August onwards 5000ft+. Landing is right in front of launch on HUGE salt flats - watch for power lines that run along road visible from launch and darker areas of salt flat may be a bit squishy. Plus one special area to avoid is the crocodile farm at the base: LOTS of unfriendly snapping handbags. Fantastic place to watch sunset from! 900ft. As for Bastion Sunset Launch above, then from the car park take a walking track to the right of the west launch about 150m was an old 4wd track for the stiffies but eroded at the start follow to the end car turnaround approx 200m little rocky but a lot better launch than Sunset launch. Good on the afternoon sea breeze 8-10kts. Ridge extends 6km to the east. Great if the wind is spot on north. Safe to be blown back if the wind picks up by running off the west end and landing on the clear salt flats. Also a smaller landing in a old tip in front of launch - good if scratching. Also two smaller hills to the left of Sunset launch work in the northly, the last one being only 200m from a ice cold beer! Kimberley, 450km SW of Darwin. From the Great Northern Highway turn down the Gibb river road approx 3km it's the first hill on the right hand side. A small 4wd track with a locked gate to the top launch contact local pilots for key. Nice launch for both stiffies and floppys with landing area to the right over the road slight down hill gradient. This being a inland site and temperatures in the 30+ region this can get a little rough. But a fantastic place to get high and cold! Kimberley, 450km SW of Darwin. Getting there from Wyndham take the King River road until you reach a salt flat that lines up into wind. Fairly close to airport but not a lot of traffic - keep a ear out! Prevailing wind March to August SE-NE and September to February SW-N. Can get a little wet between December and March and temps nearly always above 30. Pilbara region, about 1500km north of Perth. Overlooks Tom Price. Perth to the Pilbara region is drivable in one very long day but more comfortable in two. Big hill in the Hamersly Range. 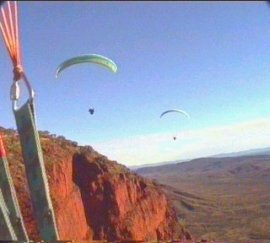 The Pilbara features the Hamersley ranges, including Western Australia's highest point Mt Meharry. Some very good possibilities for flying, the few pilots living in the region report huge thermals and cloudbases over 16000 feet on the best days. Great potential! Pilbara region, about 1500km north of Perth. Overlooks Harding Dam, about one hour from Karratha. Perth to the Pilbara region is drivable in one very long day but more comfortable in two. Impressive site near Karratha, which will take any wind direction.